With 11 days left until the big reveal, Jay and I have been continuing our weight loss efforts. Eating low fat (and in my case, low carb) foods and smaller portions seems to be the key for us, and it's becoming more of a habit to go for the lighter items first. Hopefully we are making life-long changes here as we both like the way we feel today. About six weeks ago I decided we needed to start exercising again. We had been fairly diligent on the elliptical up until my surgery, and then we both fell off the wagon. I've always heard that running is the perfect exercise and have friends who love it but have always hated it personally. But in the interest of being a hot mama getting to better health, I wanted to give it a whirl. I Googled "starting to run" and came across the Couch to 5K Program. The title dragged me in so after previewing it I printed the program out and made a commitment to run a 5K. And was scoffed at by pretty much everyone I told. Like I said, Steph does NOT equal runner. Even Jay kind of rolled his eyes but was supportive enough to at least read the program for himself. And then he said (shockingly) "I am going to do this too." And so our running adventure began. The high level view of the program is simple. 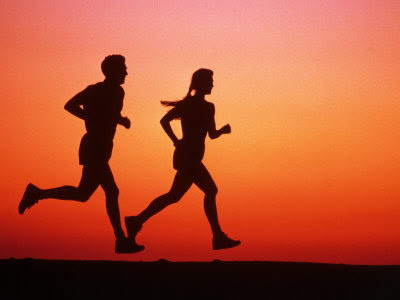 Run/walk three times a week for about 30 minutes each time, increasing the run cycles and decreasing the walk cycles. In about nine weeks you should be able to run for 30 minutes consecutively. We are currently at the end of Week 4, officially ½ done with our program. And I’ve been keeping track of how it’s been going and would like to share some of the highlights with you now. Run 1: went fine although we both had our pants almost fall down (note: need drawstring shorts) and had a hard time figuring out how long we had ran. Also, getting my not-Pod set to the right songs was tricky. pants stayed up, wore a stop watch, and was attacked by a bird. Jay complained that my stopwatch and not-Pod holder were both bright pink and he looked like a girl. Oh and that my music sucked and who would want to listen to New Kids on the Block while running anyway? Went to Target, got him his own not-Pod and holder. Jay and I ran together for the first time and I realized he’s almost a foot taller than me. Very hard to keep up but I tried to go faster than I was comfortable to stay with him. He complained I was too slow. Jay was attacked by the bird, almost pulling a hamstring. I laughed at him, then got attacked again on my run. (note to self: avoid running near tennis courts). Jay finally started getting into the groove and found a better place to run. I figured out I had exercise induced asthma and needed an inhaler. Jay is running longer and farther than the plan calls for. He finally got his own (black) stopwatch and is really enjoying running. I repeated week 3. I’m slow, but still liking this. My second attempt at week 3 is much more successful than the first. I also ran near the tennis courts last night and waved my hands around the back of my head, so when the bird attacked he only hit my hand. Much better than sticking to my hair. I am starting Week 4 tomorrow and Jay is taking a slight hiatus after an ankle injury on Saturday. Overall, we are on our way to a 5k and although I don’t think we can be called “runners” yet we are improving each day. Eleven more days till the big reveal!